Your ecommerce business model is set and your team has implemented a myriad of customizations on the ecommerce site and tested adjustments made to the user experience flow. Now all you need to do is start offering local payment methods. How strong is your payments strategy? If you are only accepting credit and debit cards issued by the major global schemes – this will not be sufficient in all nations, since in many of them, there are barriers to accessing financial services and credit. This includes obstacles with opening bank accounts, being approved for domestic debit and credit cards, and having an international credit card that can process cross-border without needing advanced authorization from the issuer. Secondly, in many regions of the world, there is a lack of trust with entering personal financial data online. And, especially on the sites of international ecommerce retailers. These problems are yours. But there is a solution available for you: local payment methods. Together, let’s explore what local payment methods are, the most popular methods in Brazil, Mexico, Argentina and other Latin American countries and how you can benefit by offering these local payment methods, including cash payments. Accepting cash? For online purchases? In another country? Yes. Keep reading and you will discover the benefits that can be achieved when incorporating local payment methods into your payments strategy. What is a Local Payment Method? Local payment methods are payment options that are utilized within a specific country. These payment methods are accepted widely within the nation, but rarely outside of the country. On a daily basis, local payment methods are accepted for all purchases within the nation and are the method of choice, mobility and familiarity for consumers. For instance, in many Latin American nations, cash payment methods are extensively used to pay utility bills and taxes. Offering local payment methods is the golden ticket to expanding globally by gaining access to entire populations and enabling customers to pay for purchases with methods they have access to and are familiar with. Other methods exist, however, these are the main payment options that we will discuss. As a merchant, if you are nearing the stage to go live and haven’t considered offering local payment methods, don’t worry. Providing local payment methods is simple when you partner with a payment processor that specializes within your expansion nation. The short answer of why payment methods matter is sales. Lots and lots of sales revenue. Local payment methods are directly related to higher rates of conversion and success for international ecommerces. Let’s imagine your sales potential in Brazil. The largest nation in terms of population with 207.5 million residents and home to the largest GDP of 1.79 trillion USD throughout Latin America in 2016. Brazilians are active shoppers who love sporting the newest trends, having access to streaming platforms and search for services that will enhance all aspects of their lives. Market analysis has shown that your business has immense potential in Brazil and other Latin American nations. Brazilian consumers are eager to buy and have money to do so. But, these shoppers must have the option to pay with methods they can easily access. To make the sale, it’s up to you to facilitate the ease of the payment process for them. If you currently operate in a specific market and are only accepting international credit cards, offering local payment methods is your solution. Let’s consider the percentage of people that do not have access to international credit cards, domestic cards, credit or banking services. According to the World Bank, 38% of the global adult population do not have access to any banking services. In terms of Latin America and the Caribbean, 49% of the adult population were unbanked in 2015. These numbers talk. These people are your prospective customers. 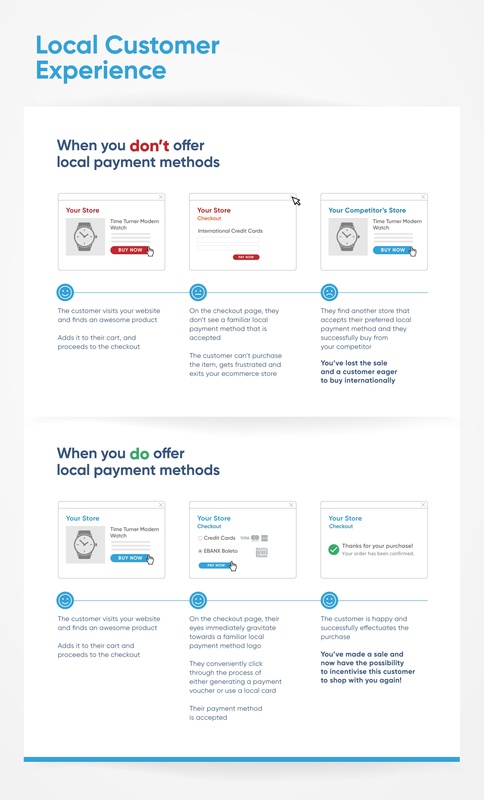 By offering local payment methods, you create instant opportunity for consumers to purchase your products and services regardless if they are banked or not. Numerous ecommerce markets around the world would be ideal for your business. Time is money and you feel this pressure. So, let’s consider that you are planning to enter or expand your sales into one of the world’s fastest growing ecommerce regions, Latin America. In 2016, the region generated nearly 50 billion USD in ecommerce sales. Brazil alone was responsible for 16.58 billion USD of the region’s total, roughly 33% of all ecommerce sales. These popular payment methods allow shoppers to pay in their currency for your products or services. With their own currency in hand or in a bank account, shoppers can pay for products that are sold online and in any currency, be it US Dollars, Euro, Pounds, Yuans, etc. Your local payment processor works its magic and you receive your settlement in USD, Euros, or with some processors, other currency options. As long as local payment methods are offered, there are no longer payment barriers to making an international purchase. Imagine, you have millions of customers who want to have access to your service or product. They are just waiting for you to provide them with the ability to do so through payment options that they can access with ease and familiarity. Initially, sales goals may be the only target on your mind. And, local payments will aid in this quest. However, local payment methods offer many additional benefits. Only when we stop to fully analyze the process of paying for something, be it a product or a service, do we realize that the experience is full of small decisions, actions, reactions and emotions. At the end of the purchasing process, your Chilean customers were able to purchase internationally and you have made sales. As discussed above, local payment methods are directly associated with enabling sales and increasing sales revenue. Additionally, this payments strategy also increases your positive relationship with the customer. You have enabled them to access a product or service that has been out of their reach or seen as a complicated purchase in the past. It is common for shoppers without an international credit card (which processes payments in foreign currencies) to ask friends or family members with authorized cards to make cross-border online sales transaction for them. This process requires the shopper to expose their lack of financial service access, to no longer have ownership of the purchasing process and requires the generous friend or family member to take on all responsibilities with making the purchase. For most merchants in the United States and Europe, the necessity to offer numerous payment methods in other nations is an initial challenge to understand. As a shopper yourself, you complete your purchase with your preferred payment option and within a few clicks the purchase is approved. The idea that your preferred payment method wouldn’t be an accepted method or would be rejected isn’t a common worry. Unfortunately, your prospective customers have these fears when shopping with international ecommerce retailers. Conclusion: local payment methods allow for a more fluid and frictionless payment experience. Offering local payment methods is not a barrier or complication for your business. On the flip side, they act as an opportunity and a competitive advantage – waiting to be tapped into. Local payment methods can usually only be accepted by businesses that have an established local entity in the nation. Lucky for you, if you partner with a local payments processor, they act as the merchant on record for your business. You can keep your business in your nation and collect local payments from other countries. Presto! Within the ever changing and expanding payments industry – local payments have become some of the most constant, trusted and relied upon payment choices. As a whole, offering a full scope of local payment methods will enable the entire population to have access to your product and services. Now that the importance of offering local payment methods is clear, start researching local payment processors that can offer the access your business needs. Here at EBANX Payments, we offer end-to-end payment solutions to connect international merchants with eager shoppers in Latin America. 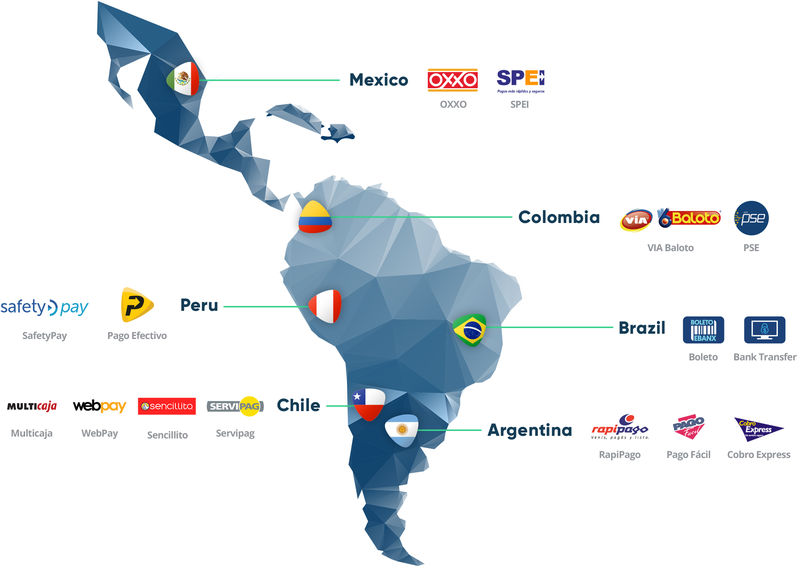 We have over 100 Latin American local payment options for international ecommerces, allowing them to expand their reach, increase access and drive sales throughout the region.